PADUCAH, Ky. — In this riverfront town in western Kentucky, art isn't just a luxury. It's a lifeline. It helped salvage one of the city's oldest neighborhoods with an artist-relocation program that lured talent from around the country. And art, in the form of 52 murals and a national museum devoted to quilting (much cooler than it sounds, I promise), served as a shot in the arm for downtown revitalization, sparing the historic area from the fate of many a small city destroyed by suburban sprawl. More recently, art is what prompted UNESCO to designate Paducah one of only six "Creative Cities" in the United States. This fall, delegates from around the world huddled there for the inaugural meeting of the Creative Cities' crafts and folk art network. 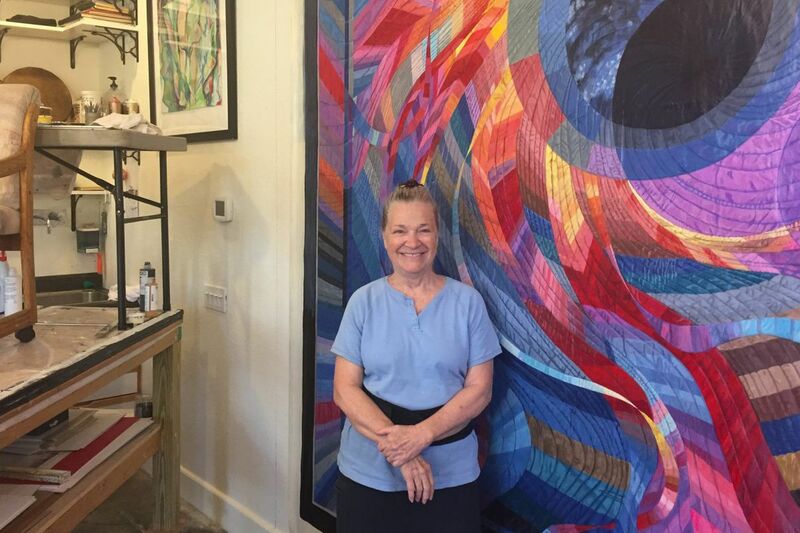 You could say art is woven into the fabric of this town of roughly 25,000, known as Quilt City USA (again, cooler than it sounds). And the creative vibe that comes with it has kept Paducah from devolving into just another pit stop off the interstate. "There's a lot more here than gas stations," said Ed Musselman, one of several Paducahans who in the last couple of years have resurrected dilapidated pieces of the city's past and recycled them into creative new spaces. Musselman and his wife, Meagan, recently restored an old Coca-Cola bottling plant in midtown and filled it with a craft brewery, restaurant, and artist collective, among other things. The Coke Plant, as it's known around town, also houses Time on the String, where the curious can take a lesson in playing the fiddle — or just about any stringed instrument — with owner Josh Coffey, a staple on the local music scene. "People thought we were nuts when we bought this building," Ed Musselman said about the 43,000-square-foot structure built at the tail end of the Depression. "We thought this was the perfect spot to showcase what makes Paducah great but isn't necessarily seen by the casual observer. If people make one stop in Paducah, we wanted it to be somewhere that might make them want to stay a little longer, maybe go to the Lower Town Arts District, go listen to live music or explore some more." Before the Lower Town Arts District was called that, it was a run-down part of Paducah few would visit by choice. "It's changed a lot from when I got here; it's a walkable, safe neighborhood now," said mixed-media artist Char Downs, who lives above her Pinecone Art Gallery & Studio at 421 N. Seventh St.
Downs moved to Paducah from the San Francisco area in 2004 as part of the city's artist-relocation program, which offered incentives to get creative types to live and work in this 26-square-block area between Third and Ninth Streets, and Jefferson Street to Park Avenue. "It was a big deal in the art world," Downs said about the program. "Suddenly, everyone knew about Paducah." A creative vibe and strong arts-and-crafts culture have helped keep the riverfront town vibrant despite suburban sprawl and other changes. Fallert's "Corona II" is among the crown jewels of the National Quilt Museum's 500-plus collection. The world's largest quilt museum, opened in 1991 at 215 Jefferson St., annually draws more than 100,000 visitors — some begrudgingly at first. "Half of our audience is people getting dragged in here by someone else, but they end up really liking it," said Frank Bennett, head of the museum. Even if quilts aren't your thing, give it a shot and take a guided tour of the museum for $15. These are not your grandma's bedspreads. They're intricate, modern works of fiber artistry that will leave you with a new appreciation of what's possible with a needle and thread. Nearby in downtown Paducah — refreshingly free of been-there-done-that-franchises and chains — you'll find several cute arts-and-crafts shops. Two good ones: the Bricolage Art Collective and Must Stitch Emporium. Both are on Market House Square, within a ball of yarn's throw of the Yeiser Art Center, whose permanent collection has more than 300 pieces by local artists, as well as by big names like Mary Cassatt and Alexander Calder. Nice gift shop, too. If all this gets your creative juices flowing, head to Make at 628 Broadway St. About two years ago, artist Kijsa Housman transformed this old photography studio and church into a public workshop space offering lessons in everything from painting to crochet to hand-lettering (she also does a bang-up business on Etsy). Or simply drop by during business hours and make a Christmas ornament, dream catcher, welcome sign — whatever you want. Housman, a Texas native, has an infectious passion for the arts, and she's happily spreading that passion around her adopted hometown. "Everywhere you look, art is being cut from the schools, funding is down," said Housman, a mother of three. "The experience of creating something with your own two hands — we're losing that. I wanted to start a fun place where that's still possible." Straight down Broadway, about a half-mile from Housman's business and studio, are 52 murals by artist Robert Dafford. The life-size paintings along the Ohio River depict scenes from Paducah's past: images of Native American villages, early explorers, the Civil War, steamboats. "It's the diary of the town," said Fowler Black, a fourth-generation Paducahan who works for the city's tourism bureau. Black was a teenager when the murals started going up in the mid-'90s. "This three-linear-block project is what I would credit as being the resurrection of community pride made tangible," he said. Night and day, tourists and locals stroll alongside these panels of visual history, snapping pictures and reading the descriptions at the base of each mural. The paintings are spread across 14-foot-high concrete walls built by the Army Corps of Engineers after a flood in 1937 nearly decimated the city. "What protected us also partitioned us from the river," Black said. "People used to congregate by the water, but that changed when the walls went up." And it changed again — for the better — when Dafford and his team used art to turn the walls into a canvas.